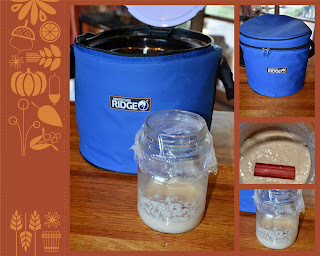 I'm not sure whether our previous sourdough starter failed to start - or started without us and we missed it! In any case, it's now finished and starting again seemed the best course of action. In the past week I've done more research about sourdough starters. It seems the optimum temperature for yeast activity is somewhere between 20 and 30 degrees. At the moment it is 10 degrees at 10am. Although the sun is out and the sky is clear, it is obviously not overly warm inside (or outside). Conditions are therefore not ideal for starting a starter but I took heart from reading some instructions here, where the author prevailed during a Melbourne winter. After some pondering I decided to start the starter tucked up in my (new) thermal cooker. I reckon it might work and if it doesn't I can always start again - again!